If you are looking to find a great natural beauty product for your skin or hair, then shea butter is a wonderful choice. The butter is obtained from a nut which grows on the shea tree (Vitellaria paradoxa) and has been used in African culture as a beauty and food product for centuries. In fact, it is said that Egyptian queen Nefertiti would apply this every night to keep her skin looking beautiful. Read on to learn about the benefits and uses of shea butter for your skin, hair and your general health. The nut which grows on the shea tree is crushed, roasted, ground, and then mixed with water to form a creamy paste. This is then kneaded to extract the oils which will eventually become shea butter. 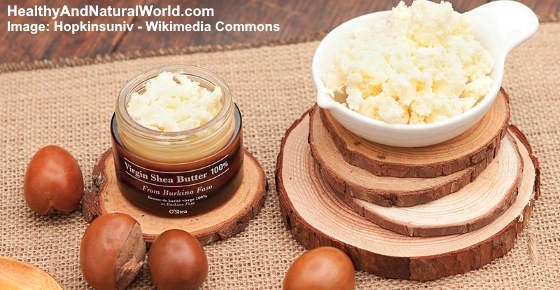 Raw shea butter contains vitamins A and E, which are well-known for their beneficial properties that promote healthy skin and reduce the signs of aging. It is also a rich source of fatty acids which are essential in nourishing the skin as well as reducing inflammation. Shea butter is also one of the ingredients in African black soap, which is made from drying and roasting the peels or barks of plants such as palm tree leaves, plantains, shea tree, or cocoa pods. Various oils like coconut oil, palm oil, or shea butter are then added to the ash to make African soap. This black soap is used to treat many skin inflammatory conditions and has many benefits for the skin. Let’s have a look at shea butter’s benefits for your skin, hair, and general health. Eczema is a skin condition where the skin becomes irritated or inflamed. The healing and moisturizing properties of shea butter make an excellent topical treatment for eczema. It can be applied liberally to the affected area daily. The anti-inflammatory properties provide needed relief and the nutrients in shea butter help promote healthy skin cell re-growth. You can also use a combination of shea butter and essential oils for eczema: Add 10-12 drops of your favorite eczema essential oils such as lavender or frankincense to every 1 ounce (30 ml) of raw, unrefined shea butter. For more useful information, read my article about the best natural ways to improve stretch marks. The collagen boosting properties of shea butter also make it an excellent product to help reduce the appearance of aging. As we age, our bodies produce less collagen and the skin loses some of its elasticity resulting in crepey wrinkly skin. Environmental factors like pollution, sun damage, and extreme temperatures can also affect the appearance of aging in the skin. You can also use a combination of shea butter and essential oils for wrinkles: Add 10 to 12 drops of your favorite essential oil such as sandalwood to every 1 ounce (30 ml) of raw, unrefined shea butter. The moisturizing effects of shea butter make it the perfect moisturizer, especially if you need deep moisturizing. You can rub some shea butter onto dry and cracked heels and hands. This also provides a protective layer to the skin and prevents the affected areas from becoming inflamed. Dry or chapped lips can be painful and unattractive. If you suffer from chapped lips during cold weather, then you’ll be glad to know that shea butter is one of the best natural remedies for chapped lips. Shea butter is emollient, which means it can soften or soothe the skin, and can be used to heal chapped lips. The emollient properties of shea butter act as a protective barrier by supplying and retaining moisture in the lips and skin. You can easily make a lip balm from shea butter: melt 2 tablespoons each of shea butter and coconut oil and 1 tablespoon of beeswax over a double boiler on low heat and mix well. Pour the mixture into a small glass container and let it cool. The consistency will be medium firm. If you prefer a firmer consistency, you can add more beeswax, and vice versa. In order to get the benefits of shea butter in treating scars, you should regularly massage it into the affected area. You can also mix shea butter with essential oils that can reduce scars or you can use other natural ways to heal scars. If you suffer from acne scars, read my other article on how to get rid of acne scars naturally. Studies have also shown that shea butter also protects against UV radiation. UV radiation causes the skin to age quicker and is also one of the main causes of skin cancer. Because shea butter is also anti-inflammatory, therefore, it can be used as an after-sun treatment to provide needed relief. It is not just the skin that benefits from shea butter, but it is also good for the hair as well. Shea butter works very well as a hair conditioner and the great thing is that it won’t leave your hair looking or feeling greasy. It can help protect your hair from drying out in hot conditions and reduce frizzy hair. Since shea butter melts at body temperature, you can rub it between your fingers to break it down into oil form. Or you can mix shea butter with other natural oils for hair to create a blend that is easier to distribute, then apply to your hair. Try to cover as much as possible, then brush your hair to make sure that all strands of hair are coated. Shea butter is good for dry scalp and helps to moisturize it. To help get and maintain a healthy scalp, you can use shea butter as a hair mask. To do this, gently heat some shea butter so it has just melted. You can even do this by letting some melt in the palms of your hands. Then using your fingers, massage some shea butter into your scalp and leave it for about 20-30 minutes. Then wash out. Shea butter is not only good for keeping healthy skin and hair, it also has many other health benefits. This is why shea butter can be used as a medicinal ointment to treat joint pain, muscle ache, bruising and swelling, and you can add to it one of these 16 essential oils for pain relief for added benefits. Some people are allergic to nuts, and that can include nuts from the shea tree. If you are allergic to nuts, it may be best to avoid shea butter until you are sure that you will not have any negative side effects. Even if you are not allergic to nuts, it’s best to do a small patch test, just to make sure you don’t develop any allergic reaction to shea butter. In order to make sure that you get the best health and healing benefits from shea butter, it is important to only use high-quality shea butter. So, always look for raw or unrefined virgin organic shea butter. Shea butter comes in various grades ranging from A to F. Only grade A shea butter will give you all the benefits that I have mentioned here. The lower grades are useful only as a moisturizer. Even if a beauty product says that it contains shea butter, you have to remember that this is refined shea butter which has been stripped of its anti-aging and healing properties. 1. Anti-inflammatory and chemopreventative effects of shea butter. 2. Constituents of shea kernels. 3. Antioxidant and antimicrobial activities of cinnamic acid. 4. The Skin Tolerance of Shea fat in Topical Preparations. 5. American Journal of Life Sciences. 7. Journal of Oleo Science. 8. The American Journal of Clinical Nutrition.